As a farmer you can use the GAIA biodiversity yardstick (a free internet tool) to get an idea of the on-farm biodiversity. The yardstick makes biodiversity measurable and comparable (with benchmarks). 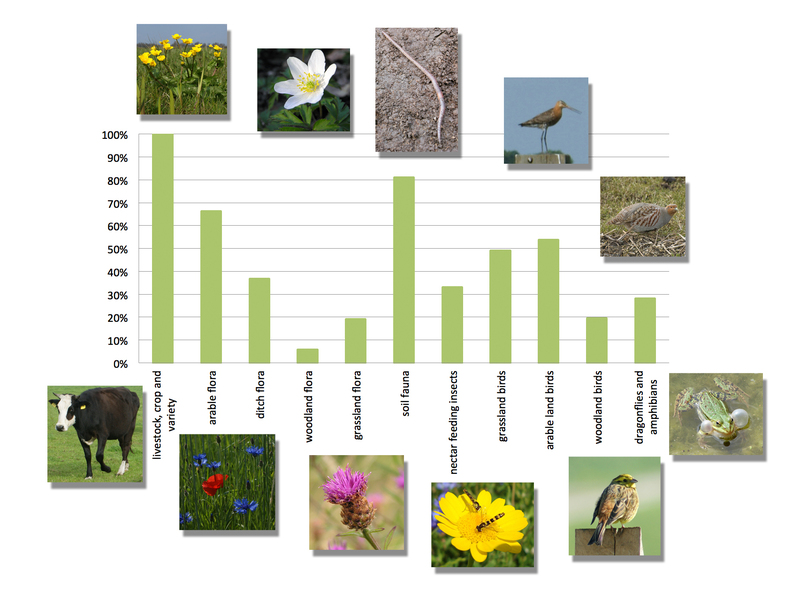 The biodiversity yardstick consists of 40 questions on 6 themes. In most cases you can click a button next a set of possible answers. The answers define scores for the 6 biodiversity themes and scores for their (positive) effect on 11 categories of flora and fauna relevant for agriculture areas. Besides this, surface areas of nature elements on the farm are shown. These surfaces don’t influence the mentioned scores. In January 2014, the Gaia biodiversity yardstick has been improved in some aspects. The improved yardstick Gaia2 has additional questions for crop protection, soil life and impact of the surroundings on on-farm biodiversity. An additional yardstick version is available specifically adapted to large scale arable farms, “Gaia2arable”. For mixed farms and small scale arable farms the general version Gaia2 is advised. To enter the Gaia biodiversity yardstick, you need to register. A password will be generated automatically and sent to you through email. This password will not only protect your data but you will be also able to adjust your data anytime. After registration you can record your farm data in approximate 20 minutes time. When you have finished a form, you should click the button “save form”. It is possible to stop recording after clicking “save form” and to continue recording at any later time. Once completely recorded, the programme will calculate your scores. You may print your score charts. Your score will become available to CLM as anonymous result and may be used in general benchmarks. CLM will never publish individuals scores without permission of the concerning farm. Please check the manual before starting. The Gaia tool is being set up as mother system, from which more specific instruments can be further developed. Targeted at particular countries, regions or crop systems. Hence the tool's name Gaia (mother earth). The prototype is being developed for the Netherlands, using species groups and management practices that are typical for a relatively intensive type of dairy, arable and vegetable farming in Northwest Europe. The prototype can therefore be readily applied in the Netherlands. Minor additions will make it applicable in other countries like Germany, Denmark and Belgium. A further step could be the enhancement of the tool for other production systems. This would require a broadening of the possible measures (varieties/breeds, management) and output (species groups). One remaining limitation, however, is the unsuitability of the tool for very extensive systems, where farmland and nature areas are hard to distinguish. In other words: Gaia is made for systems aimed primarily at agricultural production. See the latest news for recent developments. Also see an example of a poster with individual results (pdf) related to group results as can be procuded bij CLM. The data of the GAIA biodiversity yardstick are property of CLM, and CLM has full copyrights. It is prohibited to apply (parts of) the GAIA biodiversity yardstick for any other use than for own use, and to reproduce or to save (parts of) the GAIA biodiversity yardstick in an electronic system without asking permission of the owner. CLM does all it can to keep the information right and up to date. CLM is not responsible for possible negative results or damage that can occur as an effect of the use of the information of the yardstick.